The 2013 National Hockey League Draft was as deep in talented defensemen as it was steeped in diversity. And some defensemen from diverse backgrounds selected in that draft at New Jersey’s Prudential Center are beginning to make their mark in the professional game. The Columbus Blue Jackets expect big things from defenseman Seth Jones. NHL scouts viewed Seth Jones, Darnell Nurse, Madison Bowey, Jordan Subban and Jonathan-Ismael Diaby as potential impact players in the pros. Each player is chasing his dream for National Hockey League stardom, climbing professional hockey’s ladder at his own pace – or that dictated by the team that drafted him. Jones, taken by the Nashville Predators with the fourth overall pick of the draft, hasn’t spent a day in the minor leagues. But after he spent more than two seasons in Music City, the Predators traded him last week to the Columbus Blue Jackets for talented but enigmatic center Ryan Johansen. The swap from Nashville, currently sixth in the NHL’s Western Conference, to Columbus, dwelling in the NHL Eastern Conference cellar, wasn’t a knock on Jones’ play. The Blue Jackets expect big things from the Texas-born son of former National Basketball Association forward Popeye Jones. 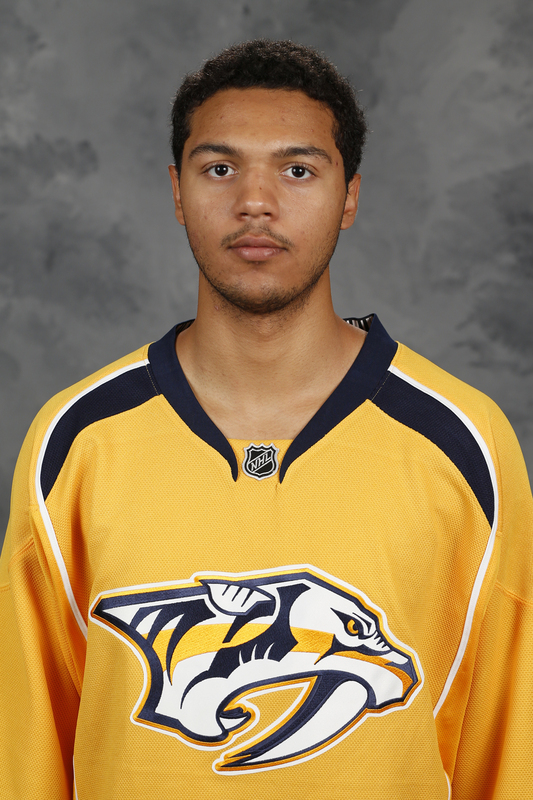 In Nashville, Seth Jones was the student to defensive master Shea Weber. In 40 games with the Predators, Jones tallied 1 goal and 10 assists and averaged 19:42 minutes on ice per game. With Columbus, he’ll play more minutes and see more power play time and penalty-killing action under demanding Head Coach John Tortorella. He’ll go from being one of the guys on Nashville’s blue line to being The Man on the Blue Jackets back end. Ironically, one of the last things Jones saw in Nashville was the player he was traded for as he and Johansen passed each other at the airport. Jones expressed excitement about the new opportunity in Columbus. Nurse believed he was NHL-ready from the moment he slipped on an Oilers jersey on draft day. But the team’s brain trust thought otherwise and sent him back to the Sault Ste. Marie Greyhounds, his junior team in the Ontario Hockey League, for the 2013-14 season. He went back to the Soo again in 2014-15. After being promoted from the AHL, Darnell Nurse is averaging 21 minutes per game. training camp and was called up to the parent club after some of its defensemen suffered injuries. Since then, Nurse has tallied 2 goals and 5 assists while averaging 21 minutes of ice time per game in 34 games. He’s also added a little toughness to an offensively-talented but grit-challenged Oilers lineup. He’s amassed 19 penalty minutes, five of them coming from a fight against Milan Lucic, the Los Angeles Kings’ physically-imposing and feared veteran forward. Some thought the bout was too much too soon for the rookie Nurse. He didn’t. Madison Bowey is only a two-hour drive from where he hopes to eventually be: With the Washington Capitals. The team took Bowey in the second round with the 53rd pick of the 2013 draft. After he captained his Western Hockey League Kelowna Rockets to the MasterCard Memorial Cup Final last season and teamed up with Nurse on the blue line to help a diverse Team Canada win the Gold Medal at the 2015 International Ice Hockey Federation World Junior Championship, the Capitals sent Bowey to the AHL’s Hershey Bears. He has 2 goals, 11 assists, and 24 penalty minutes in 33 games with the Bears. Madison Bowey hopes to be an impact player with the AHL Hershey Bears – and eventually with the Washington Capitals (Photo/Courtesy JustSports Photography). Bears Head Coach Troy Mann agrees. Jordan Subban was chosen in the fourth-round of the 2013 draft by the Vancouver Canucks with the 115th pick. His older brother, Montreal Canadiens superstar defenseman P.K. Subban, declared before the draft that Jordan was a better, more cerebral blueliner than he is. Like his big brother, Jordan is about offense from the back end. The 5-foot-9 defenseman notched 25 goals and 27 assists for the Ontario Hockey League’s Belleville Bulls last season. Utica Comets defenseman Jordan Subban (left) doing what he does best – shooting (Photo/Lindsay A. Mogle/Utica Comets). He’s continuing his offensive ways in his first season with for the Utica Comets, the Canucks’ AHL farm team, where he has 5 goals and 14 assists in 29 games. Jonathan-Ismael Diaby will be the first to admit that he’s still very much a work in progress. At 6-foot-5 and 223 pounds, he’s described himself as “bigger, taller and slower” compared to other hockey players. Nashville Predators 2013 draft pick Jonathan Diaby (left) working on improving his game with the AHL Milwaukee Admirals (Photo/Milwaukee Admirals). But the Predators love his size – a “monster,” one scout called him – and his ruggedness. Nashville took him in the third round with the 64th pick in the 2013 draft. Since then, the former Victoriaville Tigres defenseman has bounced between the Milwaukee Admirals, the Preds’ AHL affiliate, and Cincinnati Cyclones, Nashville’s ECHL farm team. The son of a soccer player from the Ivory Coast, Diaby is scoreless in five AHL games this season but has 21 penalty minutes. He has 1 assist and 11 penalty minutes in 17 ECHL games. Tyrell Goulbourne isn’t going to let a little thing like recovering from surgery on a lacerated calf muscle keep him from being with his Kelowna Rockets teammates when they compete for the Memorial Cup in a four-team major junior hockey tournament that begins Friday in scenic Quebec City. “I wouldn’t miss it if I was in a wheelchair, I’ll be there,” Goulbourne, the 21-year-old left wing told Western Canada’s AM 1150 radio. 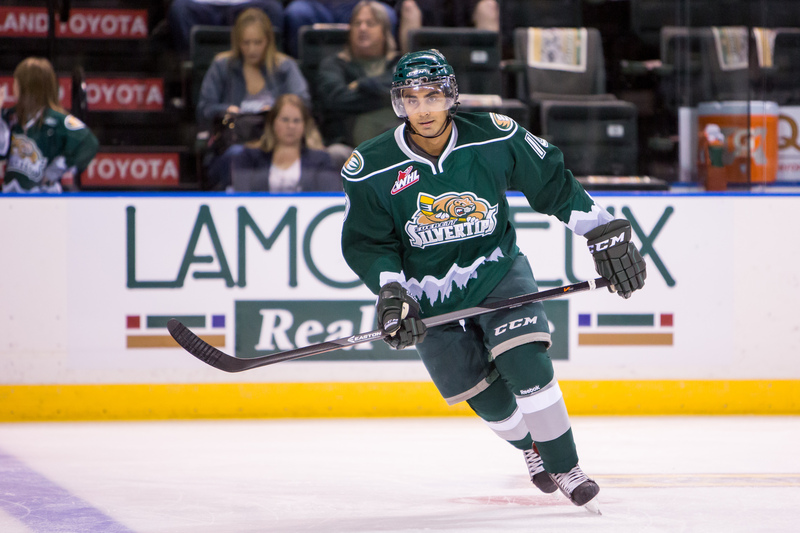 Goulbourne’s injury – he was cut by Portland Winterhawks forward Keegan Iverson’s skate in the third round of the Western Hockey League playoffs – has been the only downer in the Rockets’ ride to the 97th annual Memorial Cup tourney that will determine the Canadian Hockey League champion. Injured Kelowna Rockets forward Tyrell Goulbourne will root for his team in the Memorial Cup from the sidelines (Photo/Marissa Baecker/Kelowna Rockets). The team stormed through the Tri-City Americans, the Victoria Royals, and the Brandon Wheat Kings to capture the WHL’s Ed Chynoweth Cup, losing only three games along the way. The Rockets began the playoffs with a four-game sweep of the Americans and ended it by sweeping the Wheat Kings. The quest for the Memorial Cup begins Friday when the Rockets face the Quebec Major Junior Hockey League’s Quebec Remparts, the tournament’s host team. The Rimouski Oceanic, the QMJHL’s champions, and the Oshawa Generals, the Ontario Hockey League champs, also qualified for the tournament. An Edmonton native, Goulbourne was a major contributor to the Rockets’ 53-13-5-1 regular season record and in the team’s playoff run before his injury. A Philadelphia Flyers third-round draft pick in 2013, he tallied 22 goals and 23 assists in 62 regular season games and notched a goal and an assist in 12 playoff games. Four Rockets players were among the Top 10 scorers in the WHL playoffs. Still, Kelowna is known more for its defense. After all, this is the team that produced the likes of defensemen Shea Weber of the Nashville Predators, Duncan Keith of the Chicago Blackhawks, Tyler Myers of the Winnipeg Jets, Josh Gorges of the Buffalo Sabres and the Flyers’ Luke Schenn. Madison Bowey hoists WHL championship trophy, perhaps a practice lift for the Memorial Cup (Photo by Marissa Baecker/Kelowna Rockets). Carrying on that blue line tradition is team captain Madison Bowey, a 2013 Washington Capitals 2013 second-round draft pick. His 2014-15 season could earn him more than a look-see from Capitals Head Coach Barry Trotz during the team’s rookie camp and training camp later this year. The 20-year-old Winnipeg native scored 17 goals and 43 assists in 58 regular season games and had a gaudy plus-minus of plus-38. He had 7 goals and 12 assists in 19 WHL playoff games. Bowey also played for Gold Medal-winning Team Canada in the 2015 International Ice Hockey Federation World Junior Championship, scoring a goal and 3 assists in the tournament. All Bowey has done is win this season to the point that he’s in a position to complete a hat trick – an IIHF championship, a WHL championship, and a Memorial Cup. Another Rockets defenseman, Devante Stephens, hopes to follow in Bowey’s skates and be selected by a National Hockey League team at the 2015 NHL Draft in Sunrise, Fla., next month. He’s ranked 116th among North American skaters by the NHL’s Central Scouting Service. Devante Stephens hopes to follow a long line of Kelowna defensemen into the NHL (Photo/ Marissa Baecker/Kelowna Rockets). Stephens scored 4 goals and 7 assists for the Rockets in 64 regular season games and 4 assists in 17 playoff games. The Surrey, British Columbia, native won the team’s Rookie of the Year and Most Improved Player awards this season. If Stephens, 18, hears his named called inside Sunrise’s BB&T Center at the June 26-27 draft, he may give an assist to Bowey, whose absence from the Rockets for the world junior championship gave Stephens more minutes and more responsibility on the ice. Born in Haiti and raised in Canada, Michael Herringer helped backstop the Rockets to the WHL championship (Photo by Marissa Baecker/Kelowna Rockets). Rockets goaltender Michael Herringer has had a chance to show his stuff to Rockets coaches – and potential NHL suitors – this season. In 14 regular season games Herringer posted an 11-2 record and recorded 2 shutouts. Born in Haiti and raised in Comox, British Columbia, the 19-year-old Herringer had a 2.33 goals-against average and a .913 save percentage. 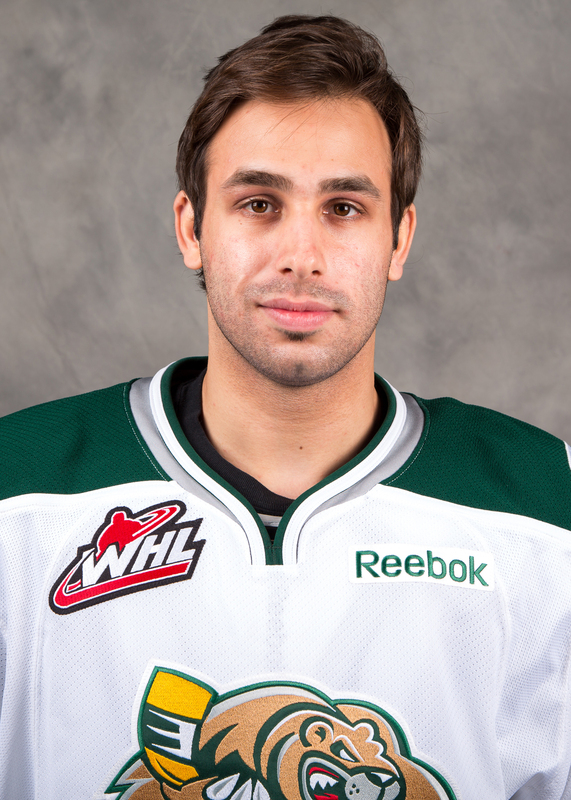 He went 3-0 in the WHL playoffs with a 1.96 goals-against average and a .934 save percentage.